Welcome to TickPick’s Michigan Stadium Seating Chart. Here we will cover everything you need to know before purchasing Cheap Wolverines Football Tickets, including seat views, student sections, premium seating, parking, and more. Michigan Stadium, home to the Wolverines, is located in Ann Arbor, Michigan. “The Big House” began construction in September 1926 and was completed on October 1, 1927. After eight decades worth of expansions and renovations, the stadium went from originally holding 72,000 fans to now upwards of 107,000. The Big House is now the largest stadium in the United States and 2nd largest in the world. The record attendance was set in a game against rival Notre Dame on September 7, 2013 with 115,109 fans. All sections at The Big House follow a standard 1-44 sequence. The only exception is in the club and suite level seating above the east and west sidelines. The vast majority of seats at the stadium are bleacher seating, meaning no chair backs. If you’re not thrilled with sitting on bare bleacher seats, be sure to bring a seat cushion. The only sections that do have chair backs are in the club and suite level sections. More on that below. The Michigan Stadium Student Section is located in sections 25-33R, and they are without question the most rowdy seats inside The Big House. Don’t expect to sit in these seats, and if you are bringing children to the game, you want to steer clear of these sections at all costs. Student tickets sell out quickly since only about 15,000 are allotted to the student body. More importantly, you won’t be able to purchase student section tickets on the secondary market as only currently enrolled Michigan students are eligible for these seats. Student tickets are also only transferable to other UM students. The club level at Michigan Stadium is located above the east sideline (where the visitors bench is located). Holding over 3,000 seats spread across two levels, the club level features chair backs, access to an indoor climate controlled lounge, premium concessions, and private bathrooms.. These sections are very small, with only 5-8 rows per section. The west side of the stadium now features the Westside Chair Back Club. This newly developed club is located in the footprint of the old press box. If you’re looking for an actual seat with a chair back, but don’t want to break the bank, then the Westside Chair Back Club is perfect for you. These are the most affordable premium seats in the stadium. The suite level at Michigan Stadium is located on both the east and west sidelines. These private boxes not only provide exceptional views, but also one of the most unique game day experiences. Featuring only 12 seats and four barstools, these fully furnished suites are small, so beware. With private parking and premium catering options to boot, the suites are the most expensive seating options in The Big House. Although there is no designated visitor sections, most opposing team fans are subjected to sit in the upper tier of the South Endzone between sections 9-15. If you are fan of the visiting team and want to ensure you sit with your fellow fans, the upper tier of the South Endzone is where you want to be. If you are a Wolverines fan, make sure you avoid these areas! This is a detailed map of the designated parking areas near The Big House. 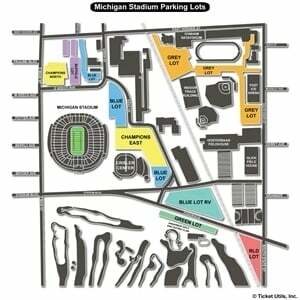 There are a number of parking options around Michigan Stadium on football game days. Many lots are permit-only, but there are also numerous options for guests looking for day of game/cash sale parking. Please go to the Football Parking Inventory page for a list of options and prices. An affordable alternative to parking on campus or near the stadium is FootballRide. FootballRide is a shuttle service offered only on football Saturdays. Tickets are $1.50 each and buses run every 20 minutes, beginning two hours before games and for one hour after the game ends. The most well-known places to tailgate are at the Pioneer High School lot, the U-M Golf Course, and AA Golf & Outing. Fan tailgating is allowed in the lots surrounding the stadium starting between 6am-7am. Cell service can get spotty, so it’s advised to mark your tailgate with a large (unique) flag so friends and family can find you. However, fans may not display flags, balloons, signs or the like more than 20 feet above the parking lot surface. Leave any bags behind, including purses, coolers, camera cases, and binocular cases. These are not allowed in the Big House. There is no alcohol served in The Big House so plan accordingly. As cliche as it is, there really isn’t a bad seat at The Big House. You can feel the energy of the crowd from all corners of the stadium. But, like any football stadium, the best viewing will come in the sections between the 30 yard lines. The best seats are located in the sections closest to midfield such as sections 22-24, 1-2, and 44. Because these sections have so many rows, you ideally want to sit between rows 10-30, so you can watch the plays develop. If you are going to a Wolverines game to get drunk and have a rowdy time, the aforementioned student sections are the place for you. There is a contagious energy that spreads from the students to every surrounding section. It makes for a unique game day experience. Remember, TickPick does not charge service fees, so if you haven’t secured tickets yet check out our Cheap Michigan Wolverines Tickets!